The Cougars defeated West Windsor-Plainsboro South, 2–0, in what is believed to be Cherry Hill East’s first home playoff game since the late 1990s. Cherry Hill High School East’s Chloe Garber carries the ball past a West Windsor-Plainsboro High School South defender during Tuesday’s Central Jersey Group IV first round playoff game. The Cougars won the game, 2–0, in what was the program’s first home playoff game in more than a decade. On Tuesday afternoon, Cherry Hill High School East field hockey hosted West Windsor-Plainsboro High School South in the first round of the Central Jersey Group IV playoffs. While there were dozens of other first-round playoff games played statewide on Tuesday, Cherry Hill East’s game was extra special. It was believed to be the first time Cherry Hill East field hockey has hosted a playoff game since the late 1990s. To make the occasion even better, the Cougars defeated West Windsor-Plainsboro South, 2–0, to advance to the Central Jersey Group IV quarterfinals. 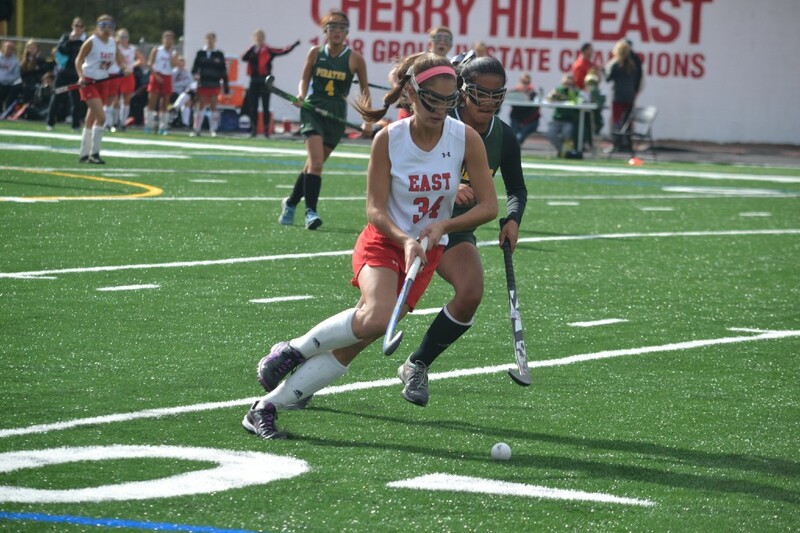 For players on Cherry Hill East, such as senior captain Becky Hollenberg, playing a home playoff game for the first time in more than a decade on the school’s new turf field was a memorable experience. “It was really fun to tell our friends, ‘You can come to our playoff game,’” Hollenberg said. Earning the right to host a playoff game is a step up for an improving Cherry Hill East field hockey program. For much of the last decade, the Cougars have struggled to win games playing twice a year national powerhouse Eastern Regional High School and other strong programs such as Shawnee High School and Washington Township High School. This season, however, the Cougars have won five games, the most the program has recorded in a single season since 2010. The Cougars have a winning record of 5–4 outside of their division, and their 2–0 win on Tuesday over West Windsor-Plainsboro South marks the second straight year the Cougars have won a playoff game. The biggest change with the program has been the number of players competing in field hockey outside of the high school level. Head coach Beth Scharff said she has encouraged her players to play at the club level. “When I first started, there weren’t a lot of girls playing on club teams,” Scharff said. The seniors on Cherry Hill East this year are witnessing the team have its best season in their four years with the program and have seen the improvements the team has made recently. Most recently, the Cougars have gotten a huge boost from its sophomore class. Five of Cherry Hill East’s starters this year are sophomores, including leading scorer Carli Ciocco, and goalkeeper Gabi Valladares. Senior captain Jordyn Elkan said the underclassmen from the last two seasons are coming with a lot more club experience. A strong relationship has been built between the seniors and underclassmen, allowing this year’s team to gel. “We’ve really branched out to talk to the underclassmen this year,” Hollenberg said. Cherry Hill East also feels it benefits from playing in the tough Olympic Conference American Division. Though the Cougars struggle to compete with programs such as Eastern and Shawnee, playing against them helps prepare them for other games on the schedule. “Playing more skilled teams help us work on our skills,” senior Lauren Edson said. “When we play teams that are more on our level, you see all of the components we’ve been working on in practice come out onto the field,” Hollenberg said. With a young core, Cherry Hill East may be hitting new highs in the years ahead. Home playoff games might be a rare occurrence for Cherry Hill East now, but Scharff believes her team has a chance to host and win more postseason games in the next couple of years. UPDATE: Cherry Hill East upset №1 seed Toms River North on Monday in the Central Jersey Group IV quarterfinals on Wednesday. The Cougars will play in the semifinals on Wednesday with a chance to advance to the sectional finals with a win.